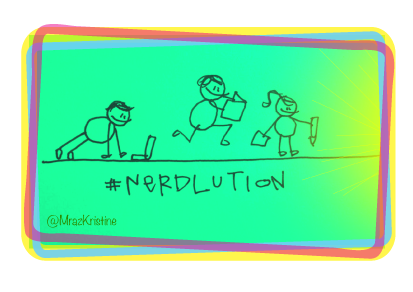 I've been watching a phenomenon called Nerdlution that is going on some blogs that I frequent (you can read some here and here and here). It started out with some people in November. I half-heartedly joined in. I was sincere in the beginning, but December was a tough month and I really didn't follow up on all my goals. I think perhaps a secret for me is setting just one goal. The year I set a goal to wear lipstick and to do a load of laundry every day was revolutionary for me. I didn't do well on the lipstick goal, but my laundry life changed - thank goodness! I'm a little late, but I'm ready to jump in now. Nerdlution is a 50 day cycle. I'm going to set a 30 day goal and a 50 day goal...starting today! My 30 day goal will be to do something to get ahead on report cards every day. 15 minutes a day is my commitment. I'm going to start with writing comments. That always takes me the longest! They'll be due at the end of February, so it's time to get going! My 50 day goal is to do 15 minutes of housework every day...FlyLady style. That's it. No financial stuff. No fitness stuff. Not that I won't worry about that stuff - but I'm just going to focus on improving in two small areas. Maybe that will be enough.